This article is about the hiking trail. For the classic cowboy song, see The Colorado Trail (song). The Colorado Trail is a long-distance trail running for 486 miles (782 km) from the mouth of Waterton Canyon southwest of Denver to Durango in Colorado, United States. Its highest point is 13,271 feet (4,045 m) above sea level, and most of the trail is above 10,000 feet (3,000 m). Despite its high elevation, the trail often dips below the alpine timberline to provide refuge from the exposed, storm-prone regions above. The Colorado Trail was built and is currently maintained by the non-profit Colorado Trail Foundation and the United States Forest Service, and was connected in 1987. The Colorado Trail is an established, marked, and mostly non-motorized trail open to hikers, horse riders, and bicyclists. From the eastern terminus at Waterton Canyon, southwest of Denver, the trail winds its way for 486 miles (782 km) through the state's most mountainous regions, to its final conclusion, about 3.5 miles (5.6 km) north of Durango. Along the way, it passes through eight mountain ranges, six National Forests, and six wilderness areas. Trail elevations range from a low of about 5,500 feet (1,700 m) at the Denver end of the trail to a high of 13,271 feet (4,045 m) on the slopes of Coney in the San Juan Mountains. The trail rises and falls dramatically. A hiker traversing the entire length of the trail will gain (and lose) about 89,000 vertical feet. The trail passes through what is considered to be some of the state's most beautiful country. Wildlife abounds and wildflowers, in season, are abundant. While much of the trail passes through forests, a good portion of it reaches above timberline, where trees are unable to grow and views are breathtaking. The trail passes through historic mining towns, along ancient Native American trails, and through a modern, world-class ski resort. Other sections appear much as they would have 500 years ago. The western half of The Colorado Trail, between Monarch Pass and Durango, has less human influence, greater vistas and a display of spectacular wildflowers. For 235 miles (378 km), The Colorado Trail runs concurrent with the Continental Divide Trail along the Collegiate East route. On the Collegiate West route, the Colorado Trail follows the Continental Divide Trail for 80 miles (130 km) more. Summer days are warm with cool nights, but unpredictable mountain weather can threaten snow any month of the year. Violent thunder and lightning storms may ravage the afternoon sky, then quickly give way to warm sunshine and cloudless skies. The practical season for the entire Colorado Trail is roughly July, August and September, though low elevation portions near Denver are often accessible April through June. In the winter, large parts of it are prohibitively difficult because of deep snow. The majority of thru-hikers (those who hike the entire trail in one trip) hike from east to west. This choice of direction is preferred partly because snow typically melts earlier in the year on the eastern portion of the trail than on the higher western portion. In addition, the east-to-west hike allows a thru-hiker to start with more gradual elevation gains and build up to the more rugged terrain of the western portion of the trail in the San Juan Mountains. The time required for a thru-hiker to complete the Colorado Trail varies greatly. While some supported trail runners can finish it in less than 10 days (the unsupported fastest known time is 9 days 12 hours 32 minutes by John Zahorian), most thru-hikers spend about 4 to 6 weeks (28 to 42 days) on the trail. The Colorado Trail is one of the few major long trails that allow mountain biking. Mountain bikes are permitted along most of the trail, but there are six wilderness areas where it is against federal regulations even to possess a bicycle. As a whole, the trail is of interest to bicyclists from beginners on up. Top cyclists consider it to be a world-class long-distance trail. ^ The Colorado Trail (8th ed.). Golden, Colorado: Colorado Mountain Club Press. 2011. p. 9. 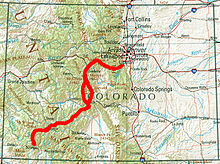 ^ "Colorado Trail (southern segments)". Epics. International Mountain Bicycling Association. Retrieved 2016-02-06. ^ "Mountain Biking the Colorado Trail". The Colorado Trail. Colorado Trail Foundation. Retrieved 2016-02-06. This page was last edited on 24 March 2019, at 01:16 (UTC).